Hi everybody, I'm Spitvalve (I know a weird name xD). You can call me Spit, Spitters, Valve...or whatever you want (you can call me Chelsea if those are too weird for you lol). A new friend of mine Black Tribal referred me to this forum and I would like to meet you all. 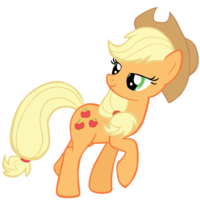 I am a newbie when it comes to MLP so please bear with me. A little bit about myself: I am a trumpet player and am currently going to college for Acoustical Engineering and Music. One of my favorite things to do in my spare time is gaming; I am an MMO gamer at the moment and to be more specific I am currently playing Guild Wars 2. Some games in the past I have played include Runescape, Minecraft, Skyrim (and other Elder Scrolls), Pokemon, and the list goes on...well I hope that was enough of an introduction for you guys to get at least a glimpse! Welcome to Brony Awakening, please leave your coat by the door, help yourself to the fridge in the kitchen, the key is under the rock outside, pick any room to work/live in, bathrooms are on the top floor (and out of order), stay out of the basement and the shed outside, ignore whatever you hear coming from the walls and said shed and basement, and please enjoy your stay! Welcome to our merry mismatched band of misfits. Do you still play RS? I would have said to add me, but never mind. Well Hai thurr! ^w^ Names Riftonic, or Rift:3 Ish one of the resident musicians here. Hope you enjoy your stay and there's cookies by the fridge!! I think they got the water de-contaminated so it should be good to drink again! Greetings, Spitty. May i call you Spitty? i didn't see that on your suggestions for nicknames. Anyway. I'm the Doctor. Little bit crazy and constantly changing my personality to be compatable with the current situation or whatever i just finished watching. In this case it was the Doctor placing a game of chess. Know the episode? Great, moving on. I'm Nevel, resident grandpa and beloved nutcase who does everything and has loadamoney. Now! Guild Wars 2? Good game, i have that myself, don't play it anymore, tho it's still installed. All my friends reached max level and never come back to help me. Some friends *rolls eyes* Am i right? Well i'm getting really long winded in my welcome, but again, That's the Doctor talking and those who know me, know my YouTube and know that i can go insane. How insane? Hi there! I'm Shadow (A.K.A Mr. Foster). What's up. I'm Flutterdude, the resident nomadic hermit who makes periodic ventures back to the civilized world like so. Thank you for all the welcomes :) Sorry if it seemed like I died or dissapeared or something...I've been busy with work all week.